"OUCH!" is something you might say when you smack your finger with a hammer or watch your favourite rugby player knocked to the ground by a bruising tackle. "OUCH!" is also something you might say if you ever watched an anchor and chain cut a swath of destruction through a coral reef. Now the word "OUCH" has a whole new meaning. It stands for Order of Underwater Coral Heroes. Now you say "OUCH" when you want to get involved in protecting coral reefs. To understand the history of OUCH, you have to go back to the late 1980’s. At this point, it was becoming apparent to Whitsunday reef tour operators that anchor damage was becoming a significant problem, particularly at the more popular dive sites around the Whitsunday islands. The state and federal governments were lobbied to do something for the better part of 4 years, but to no avail. Then one day in 1994, a video tape found its way onto the ABC's 7:30 Report, showing anchor damage in the Whitsundays. Within two weeks of the ABC program, the government found the money to support what has become known as the Reef Protection Program, and a loose group of volunteers formed OUCH to support the program. Thus was the beginning of the OUCH Volunteers. The OUCH Volunteers are now an incorporated, non-profit organisation dedicated to the protection of the local marine environment. 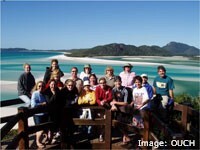 OUCH has a current membership of over 100 volunteers from all corners of Australia as well as abroad. The members are a diverse bunch, ranging from the serious diver to the relaxed beachcomber and everybody in between. 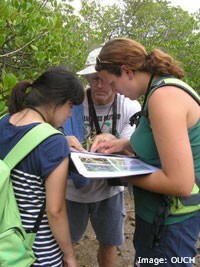 Research: foster involvement of volunteers in research and conservation of the marine environment. 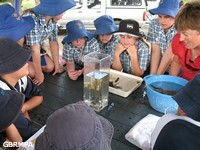 Education: provide education and training for reef users and the community on protecting the marine environment. 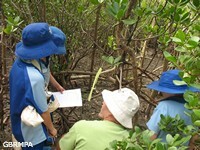 Advocacy: create community support for the conservation of the marine environment. Over the years, the OUCH Volunteers have been honoured with numerous awards.